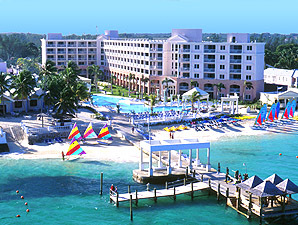 Sandals Royal Bahamian Resort & Spa Located on West Bay Street 15 minutes from Nassau International Airport and 10 minutes from downtown Nassau. 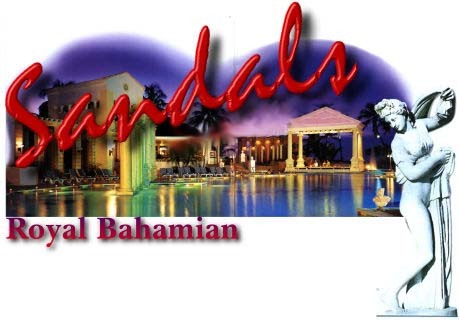 Sandals Royal Bahamian Resort & Spa is the only 5 star diamond award resort in the Bahamas was also voted the Caribbean's Leading Resort by travel agents worldwide. Sandals Royal Bahamian Resort & Spa is also the Bahamas' only all-inclusive with a world-class European spa, (Spa services additional) 8 gourmet restaurants, 7 pools including 2 colonnaded pools with swim-up bars, and a magnificent private offshore island with 2 beaches, a pool and a restaurant, all included at this monument to regal elegance. Sandals Royal Bahamian Resort & Spa is the Caribbean's most elegant all-inclusive resort, combing the architectural majesty of Europe with the seductive passion of the islands. Located in The Bahamas on Nassau's world-renowned Cable Beach, this impressive resort is a retreat for couples who prefer indulgence without limits, and luxury without boundaries. No detail has been spared to bring you an experience which is unparalleled in every respect, and uncompromising in every aspect. Relaxation is a state of mind, and at Sandals Royal Bahamian Resort & Spa stately columns seem to guard you from every intrusion. You'll be perfectly comfortable in our sparkling main pool, the island's only heated pool. Or escape to one of our three private mini-pools for intimate moments alone together. Soothe your senses in the swirling sensation of one of our four whirlpools surrounded by classical statues. 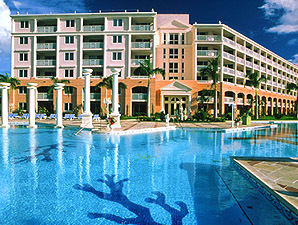 Or energize your spirits in the islands only misting pool. For the ultimate vacation within your vacation, you can escape for the day or for a few hours to our majestic off-shore island, Sandals Cay. Romance should always be an adventure, and it is, because an endless agenda of land and water sports is included, such as scuba diving. Indulge in the pleasures of the Caribbean's most luxurious, extensive European spa. The spa offers a variety of personal services and applications, from deep sea mud baths to Swedish massages and reflexology. Sandals Royal Bahamian Resort & Spa offers a remarkable range of luxurious accommodations, from beachfront rooms and villas to suites. With eight outstanding gourmet restaurants to choose from, Sandals offers a world of culinary delights to be savored to the fullest, including French cuisine at the Art-Nouveau inspired Baccarat. Good times are always on tap at The Cricketers, our authentic English pub. And you're welcome to strike up a brilliant conversation at The Crystal Lounge or our elegant piano bar. 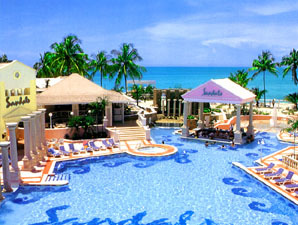 Sandals Royal Bahamian Resort & Spa is for the most discerning couples who wish to indulge in the best of the best. Waterskiing is not offerred at this resort. 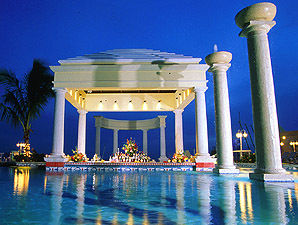 - Offshore Island with another pool, hot tub, restaurant, and beach area. 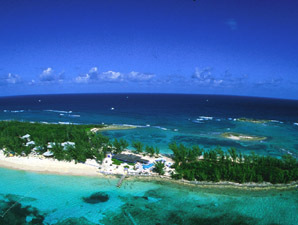 Guests will be charged additional fees for scuba diving services at the resorts. If a guest does both the resort course and the certification, the charge is $350.00 USD per person. All guests who complete the resort course will receive a certification good for a year at any resort. These fees will be charged at the resort. AT ANY TIME, WITHOUT NOTICE. This page last updated on January 5, 2011.